If you think that slavery in the U.S. ended in 1865, think again. It is common to think – if we even do stop to think about it – that this is a problem that occurs elsewhere: Asia, Eastern Europe, Africa, South America. And that would be true. But we often don’t realize that this problem occurs all across the United States as well: in small towns and big cities, along highways in truck stops, and around big sporting events. 12-14 years old = average age of entry into commercial sexual exploitation in the U.S. But the issue is more than numbers. It is about individuals who lose their freedom at the hands of unscrupulous exploiters. In every country except one, the major contributing factor to human trafficking is poverty. The exception is the United States where the major factor is the breakdown of the family. Large sporting events are attractive to traffickers, and the Super Bowl is “the single largest human trafficking incident in the United States.” (Texas Atty. Genl. 2011) Because New Jersey is a major transportation hub, with easy access to highways and many transit lines to cities across the East Coast, it is particularly susceptible to the spike in human trafficking that the Super Bowl brings with it. And the Super Bowl is coming to NJ in a few weeks on 2/2/14. So is there a “little” that you can do? Are you ever on social media? Facebook, Twitter, Pinterest, Instagram? Do you have or read blogs? Well you’re reading this one, so I’m guessing the answer is YES! 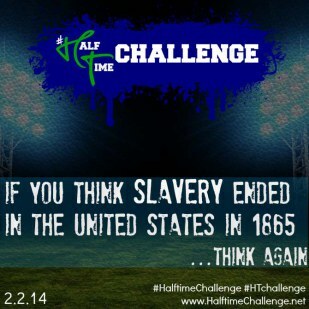 My group Justice Network created a campaign called Halftime Challenge or #HTchallenge as an initiative of NJ Coalition Against Human Trafficking. This aim of the campaign is simply to have as many people as possible spread the word about human trafficking through social media. The website provides free graphics, quotes, stats, etc. for you to share with your network of friends. I urge you to check out www.HTchallenge.net for more information. It’s as simple as copy, paste, click! Let’s get this issue trending!! Last week, President Obama proclaimed January 2014 as Human Trafficking Awareness Month. And for the past few years, January 11 is Human Trafficking Awareness Day in NJ. Many towns and churches will be hosting events. For NJ events across the state, check out the website of the NJ Coalition. January 15 7:00 pm Bergen PAC - Human Trafficking Awareness Day Observance featuring performances including “A Day In The Life,” singer/songwriter Courtney Wong, and the Justice Movement Dancers, among other influentials. January 25 & 26 S.O.A.P. (Save Our Adolescents from Prostitution) training and outreach. Provide support for victims of human trafficking who may be in NJ during Super Bowl 2014. And if you want to do “a little more”, there are plenty of opportunities. Check out my prior post on Circles of Faith for a list of local and global organizations on the front lines of this issue. Susan Panzica is a Jewish Jersey girl who loves Jesus, her family, the ocean, and mangos. Her passion is to bring an eternal perspective to earthly matters through writing, speaking, teaching, and coffee dates. A quasi-emptynester who works with her chiropractor husband, she thoroughly enjoys when her college age children are home, with or without all their friends. Susan is a speaker, women and children’s Bible teacher, and writer of the devotional blog Eternity Café.